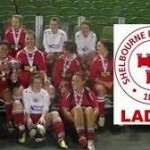 Dave Hooper caught up with coach Casey McQuillan, and players Noelle Murray and Rebecca Creagh in advance of the Shelbourne Ladies V Wexford Youths league match on Sat 14th Nov. The match was subsequesntly called off due to an unplayable pitch. But this is what they had to say.